Published in the Dover Express, 27 June, 1980. All these harbour schemes came to naught, and Dover, which had been on the tiptoe of expectation all that time, growing tired of waiting for outside aid, Sir William Crandall, who was then beginning to exercise a controlling influence on the Dover Harbour Board, stirred up that body to do something, on its own account, to provide deep-water harbour accommodation suited to the wants of the large vessels engaged in the passenger and cargo traffic of the world. An Act of Parliament was obtained in 1891, for the construction of the Dover commercial harbour, and a passenger tax was sanctioned to assist in financing it. The plan designed for this deep-sea harbour outside the pier heads, was drawn by the late Sir John Coode, consisting of three parts — (1) the eastern arm. (2) a landing station, and (3) an extension of the Admiralty Pier to cover the eastern arm. 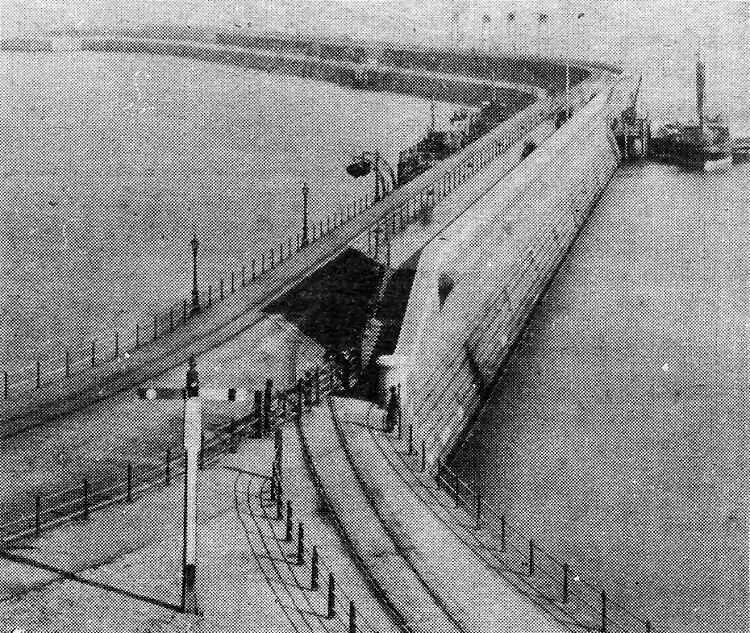 The eastern arm (since named the Prince of Wales Pier, after the then Prince of Wales, later King Edward VII, who laid the foundation stone), completed, added 75 acres of sheltered water area, the seaward parts of which provided 40ft depth at low water, serving for berthing the largest liners crossing the Atlantic when this book was published in 1907 and bringing an entirely new branch of traffic to Dover. While the Prince of Wales Pier was being built, the Government took up the scheme of constructing a large harbour at Dover. The object was to make an enclosed area, solely for naval purposes. The Admiralty Harbour was designed by Messrs. Coode, Son, and Matthews, and enclosed 610 acres, and consisted of four important works — (1) a sea wall, 3,950ft. long, under East Cliff, which reclaimed a considerable area of land; (2) the Eastern Arm, striking out in a southerly direction from the eastern end of the sea wall, and 3,320ft. long; the Southern Breakwater, 4,200ft. long, which is parallel with the shore, and nearly a mile from it; and (4) the Admiralty Pier Extension, adding 2,000ft. to the end of the original work, and slightly overlapping the Southern Breakwater. The money for these great works were provided by the Naval Bills, the first of which was passed in 1895, the estimate for the work being £3,500,000. There are two entrances to the harbour, one between the Eastern Arm and the Southern Breakwater, and the other between the Southern Breakwater and the Admiralty Bier. The harbour was built entirely for use by naval vessels; and an Order in Council, made in 1904, reserved its use entirely for that purpose. Moorings for 13 battleships, four big cruisers and 10 smaller cruisers, as well as 36 torpedo craft, were commenced to be laid in 1905. The construction of the harbour was let to Messrs S. Pearson and Son, the contract to be completed in 1907-8. The construction of the naval harbour made it necessary to , alter the plans of the commercial harbour, and the Prince of Wales Pier was carried, out in a straight instead of a curved line. The Prince of Wales Pier was completed in 1902, by Sir John Jackson, the contractor. 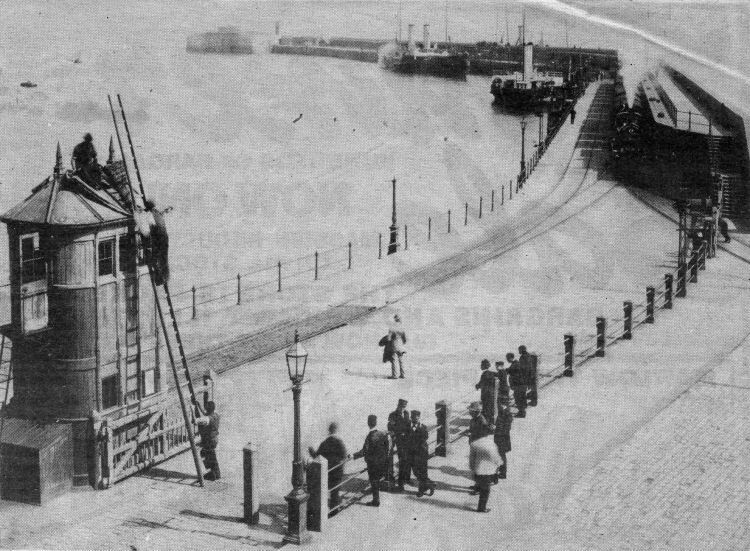 A berth for large Atlantic liners was constructed on the east side of the pier in 1904, and an electric swing bridge constructed to carry the railway over the Wellington Dock entrance on to the pier. In 1906, an Act of Parliament, by which the Harbour Board undertook to transfer their berths to the Admiralty Pier Extension, and to hand the use of the Prince of Wales Pier over to the Admiralty, was passed. The same Act provided for the widening of the old portion of the Admiralty Pier, for the construction of a Continental marine station. The length of the piers and breakwater that now enclose the great harbour in Dover Bay is over two miles. The area of the Admiralty harbour is 610 acres; the commercial harbour, 75 acres; the inner docks, 23 acres; or a grand total of 708 acres. One of Stirling’s ‘mail’ engines in black livery hauls a boat train towards Folkestone in this view of the Admiralty Pier taken by Jacolette about 1890. It shows the turret of two 81-ton guns at the end of the pier. Above is an earlier view without the turret and with the funnels of the twin-hulled paddler Calais Douvres showing over the parapet. Before the massive national harbour was built this was the scene which met cross-Channel shipping on arrival at Dover. Dating from about 1830 the picture shows the towers of the Crosswall between the narrow entrance between North and South Piers.